FIGS. 1-4. 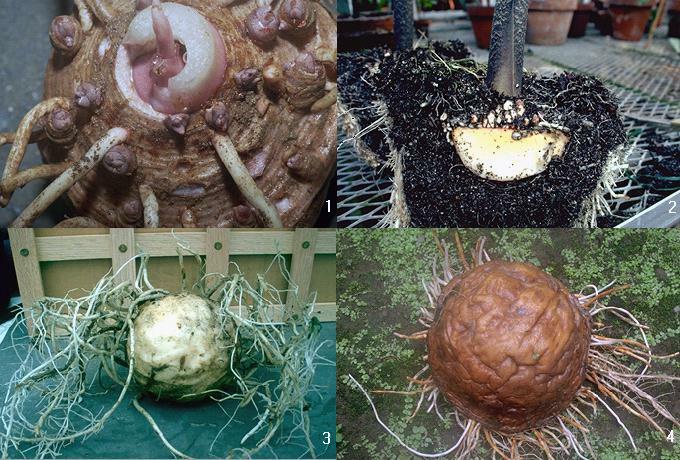 Tubers of Dracontium. 1. D. spruceanum (Schott) G. Zhu (Zhu 1505), top view. 2. D. amazonense G. Zhu (Croat 56898), longitudinal section. 3. D. plowmanii G. Zhu (Zhu 1466), bottom view showing smooth, whitish, fleshy condition during vegetative season. 4. D. grayumianum G. Zhu (Zhu 1506), bottom view showing brownish, shrunken condition during reproductive season.